Zarf Belford is a young troll who attends Cotswin Middle School in the kingdom of Notswin, where lunch is served by Goldilocks, who always ensures the food is neither too hot nor too cold, always just right. In terms of the social hierarchy, he’s anchored at the bottom because of his heritage. Even the Normals / Animals and Band Kids / Minstrels rank above him. His best friend is Kevin Littlepig, who lives in a brick house (of course) and whose family is in the construction business after that mess with the huffing and puffing wolf. Chester is the son of the King’s jester, but hasn’t been blessed with his father’s humour. To make up for it, he studies joke books, and desperately flails at even the easiest of puns. The trio often hang out at the Wishing Tree – which, instead of granting wishes, actually makes them, again and again, mumbling to himself, until the kids shut him up with peanut butter. Zarf’s nemesis is Prince Roquefort, next in line for the throne, and who will only grow into a larger thorn in Zarf’s side as time goes by. We learn all this background in the opening twenty-or-so pages of Rob Harrell’s first book in his new middle grade book series – and from here, we join Zarf and his friends on a quest that will see them overcoming their fears, beating the odds, and learning valuable life lessons; but they’re never belaboured, always funny and nuanced in a fashion that’s sure to keep young readers turning the pages. Harrell is a cartoonist, and his novel is peppered with chuckle-worthy illustrations, emphasizing the pure ingeniousness of Zarf’s world, a unique blend of fairy-tale tropes and characters and elements from our world. One minute, Zarf is being challenged to a joust on a swampfrog and the next he’s getting a call on his cell phone and referencing Spider-Man. There are enough pop culture references throughout to ensure parents enjoy the ride as much as their children; a fine feat indeed. 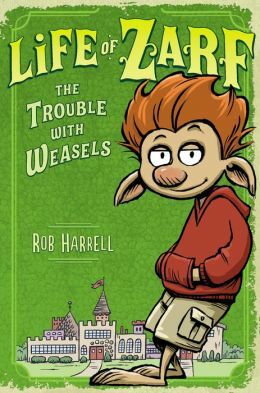 LIFE OF ZARF: THE TROUBLE WITH WEASELS is a fantastic addition to middle grade fiction. If your kids have exhausted the entirety of the Wimpy Kid series and are looking for something new, this could be it. Heck, buy it for yourself. It’s that good. We loved Monster on the Hill! I’m looking forward to reading this. Thank you!